Full-size Asian gardens often include stone clusters evoking mythological places such as Mt. Horai, the home of the immortals*. 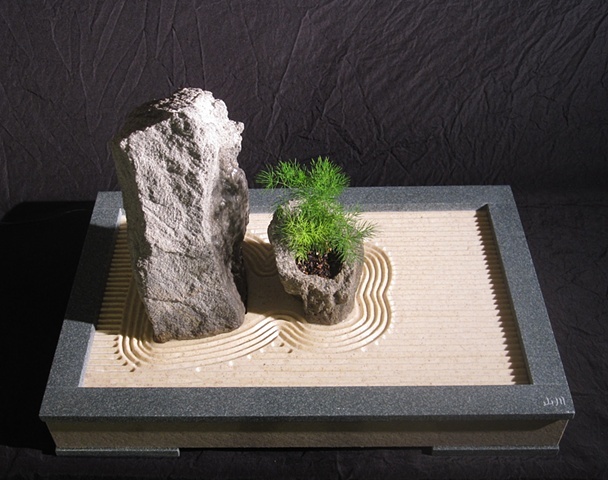 In this miniature garden, a Ming fern evokes the pine trees which often accompany Mt. Horai compositions. Adjacent to the fern planting, a waterfall cascades from the face of the sentinel stone, fed by a miniature pump beneath the Corian surface, hand routed to reflect the raked stone of traditional Japanese gardens. The tray is fabricated from recycled Corian countertop material and composite deck planking. 14" x 21" x 14"